Comply Or Die won a thrilling renewal of the John Smith's Grand National over Aintree's daunting fences. David Pipe's charge, ridden by Timmy Murphy, had to pull out all the stops after the last fence as he was pressed by Irish challengers King Johns Castle and Snowy Morning. But the well-backed 7-1 joint-favourite galloped resolutely to the the line to score a famous victory in the colours of leading owner David Johnson, winning by four lengths. King Johns Castle (20-1) was second, a length and a half ahead of Snowy Morning (16-1), with Slim Pickings (10-1) 16 lengths further away in fourth. Murphy, winning the race at the 12th attempt, told BBC Sport: "I can't believe it yet, it's the best ride I've ever had over these fences. He got into a lovely rhythm and he jumped fantastic. He picked up again when Paul (Carberry, on King Johns Castle) came at me. "I'm delighted for David Pipe and my boss David Johnson, it's a race he's always wanted to win." An emotional Pipe said: "I can't really describe it. Gordon Elliott trained last year's winner and is a good friend - he was one of the first to come and congratulate me. "It's great for everyone, for the whole team. We couldn't do any of it without them. I've had a great teacher in my father (many times champion trainer Martin Pipe), David Johnson has been brilliant, and Timmy gave him a fantastic ride." Winning owner Johnson added: "I've probably run 20 in it before, and it's a thrill. It was a typical Timmy ride. He showed how good he really is." Class 1, Grade 3, £800,000 total Prize Fund, 4.15pm, Aintree, Saturday, April 5, 2008. 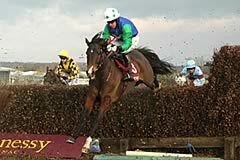 For six-year-olds old and upwards which are allotted a rating of 110 or more by the BHA Head of Handicapping following a review of the horses entered and after taking account of races run up to and including February 3, 2008. Horses which are not qualified for a rating in Great Britain or Ireland at January 29, 2008, may also be entered. Such horses may be eligible for a weight providing the Handicapper is satisfied that the horse's racecourse performances to February 3, 2008, would merit a minimum rating of 110. To qualify horses must have run at least three times in Steeple Chases run under the Rules of Racing of the same Recognised Turf Authority up to and including February 3, 2008. At the Handicapper's discretion such horses may be allocated a rating. The decision of the BHA Head of Handicapping shall be final. No penalties after publication of the weights. Entries closed January 29, entries revealed January 30 (150 entries, 1 not qualified), weights revealed February 5, first forfeit stage March 4 (125 remained), second forfeit stage March 18 (115 remain). Confirmation stage March 31, final declaration stage 10am, April 3. Form figures supplied by Weatherbys and are correct up to the racing of Monday, March 17. Ollie Magern & Cornish Rebel were taken out at the final declaration stage. Reserve 1 Ardaghey utilised after Opera Mundi was taken out early on friday. The other three reserves will not be used.